It’s hard to see the squatter, until you take a closer look (below). 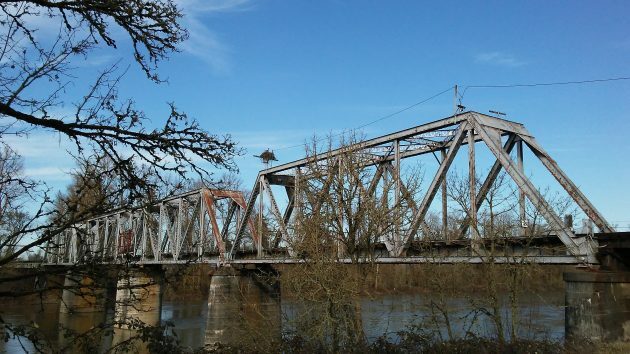 Mr. and Mrs. Osprey are not going to happy if they now return to their nest atop the steel railroad bridge across the Willamette River at Albany. Somebody else has taken up residence in their customary abode. My bike and I were cruising down the riverside Dave Clark Path on Monday, enjoying the afternoon sunshine. Loud squawking from the river drew my attention. The racket was coming from a pair of Canada geese that were settling in on one of the pylons on the river’s far side. Then I looked up, and another goose was looking around from the long-established osprey nest on top of the old electric or telegraph pole up there. This was just one goose. Possibly its mate was out and about, looking for a better spot. But what happens if the newcomers decide to stay and sit on a couple of eggs until they hatch? And the ospreys that built the nest come back and find them there? Geese taking over osprey nests, I learned online, are nothing new. In 1987 the Journal of Raptor Research, published by the Raptor Research Foundation in Waco, Texas, reported the results of a five-year study of nest site competition between Canada geese and ospreys at Lake Almanor in California. The lake is in Plumas County, about 60 miles east of Red Bluff. This same phenomena occurred a few years ago, only on one of the pylons upstream from the Ellsworth St. bridge. We were fortunate enough to watch later when one of the goslings was pushed from the nest by one of the parents. It was a long fall, bit of a splash and it swam away. Another one of those times when we wished we had our camera!!! 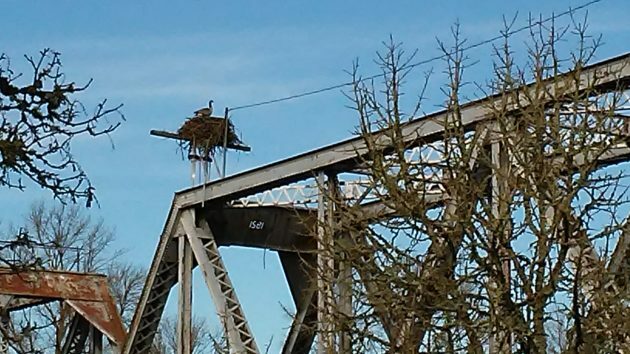 Perhaps CARA could begin a proper nest-building program across the length of the bridge, commissioning goose nests, then osprey nests and other nests of other winged creatures. Affordable housing so that all birds might avoid living on the street. Foreshadowing what is in store for us in the coming weeks?